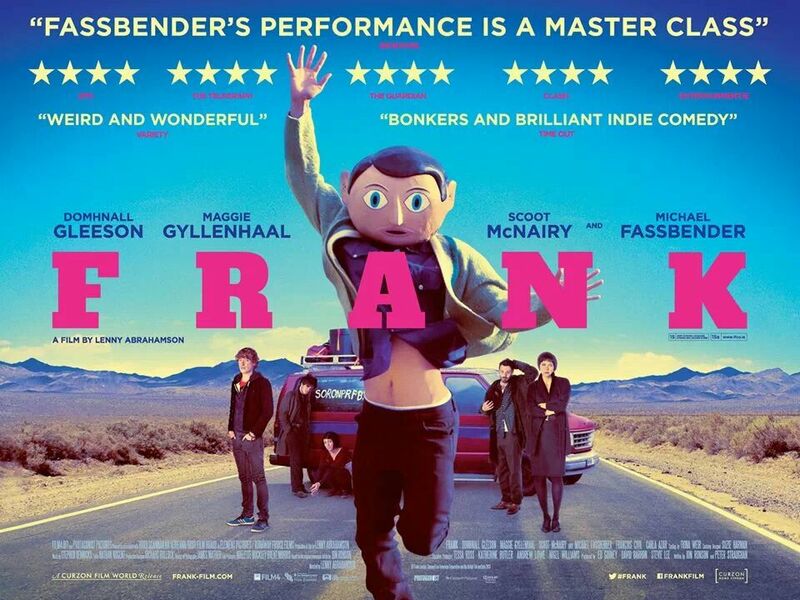 Frank (2014) – Hooray For Movies!! Frank, Lenny Abrahamson’s follow up to his dark and brooding What Richard Did, is a 180 degree tonal shift from his debut feature and a brilliantly original take on the idea of artistic integrity over commercial success, something Abrahamson will attest to as an independent film maker. Opening with a laugh out loud funny insight into how thousands of aspiring singer song writers try and find their inspiration only to realise they are rehashing something that has already been done, Abrahamson sets a bitter sweet tone that lasts until the last flat note is muttered some 90 minutes later. Domhnall Gleeson is Jon Burroughs, a terrible singer-songwriter-keyboardist who tries to write songs about things he sees in a sub-par Scouting For Girls jaunty pop style. He has 14 followers on Twitter and when he does have a breakthrough it takes about 4 bars for him to realise he really hasn’t at all. His life changes in a blink though when he is invited to play keyboard in an enigmatic American indie band called The Soronprfbs [sic] after he unwittingly witnesses their existing keyboard player try to very permanently remove himself from their lineup. Having never heard them until he steps on stage, he quickly finds himself in the midst of a band that makes My Bloody Valentine look and sound like One Direction (1 Direction? 1D? 1->?). It is a sonic awakening for Burroughs who is suddenly and mercilessly exposed to the artistic dysfunction that is the life-blood of the uber-hipster 5 piece. At the magma hot centre of this is Frank (Fassbender); a strange and conpelling man who was born to wear the title of Enigmatic Frontman. 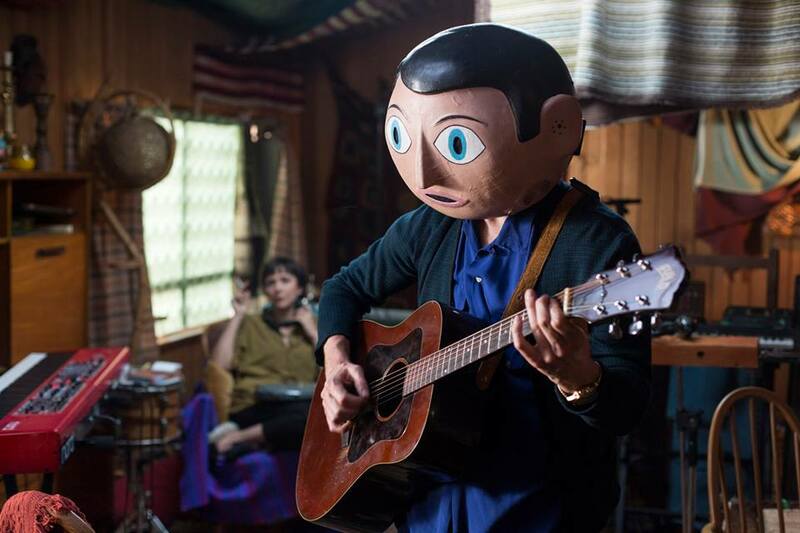 What separates Frank from most others though is his mysterious compulsion to at all times wear a giant papier-mache head (which, although never alluded to in the movie, is based on the popular 90’s comedy character Frank Sidebottom, who also notably made an appearance in Filth (2014)). Where he comes from is also somewhat a mystery, as is why he ended up in a mental asylum with the bands manager Don (Scoot McNairy). What is clear is that everyone loves Frank, a man with the spiritual draw of an entry level deity, and Frank wants everyone to love him. Which given the marginal style of their music and the reluctance of fearsome matriarchal band member Clara (Maggie Gyllenhaal) to adapt it to a wider audience is unlikely. When Frank takes a shining to Jon, the mildly talented ivory tinkler sees an opportunity to worm his way in like a testicle-endowed-ginger-Yoko and slowly tries to convince Frank to make the band more commercially viable in order that Jon can live out his long sought after dream. If Jon is Yoko to Frank’s prospective Lennon, then Clara is Kim Gordon to Frank’s more immediate Thurston Moore. What follows is a laugh out loud hilarious, heartbreaking, often touching journey through the hell of being in a band trying to go in two different directions, which for those of us who have been in and around professional bands know is all too common. I am going to digress a little for a second, but bear with me as it all ties in eventually. As someone who took great pleasure from being a music snob in their late teens and twenties, Frank struck a particular chord (some pun intended) with me. For many a long and weary night was spent arguing, amongst the many things with my other music snob friends, the meaning of artistic integrity. As fans of Ian MacKaye and his Fugazi led DC DIY music scene, as well as the likes of Sonic Youth, Sleater-Kinney and more recent bands like Les Savvy Fav and Blonde Redhead, we all appreciated the importance of lo-fi, raw music which bucked against any kind of commercial interference. Where we often diverged in opinion and started on the road to all out hipster brawling (it involves furious combative moustache waxing, ask your Grandad/nearest organic coffee store Barista), was whether there was any artistic merit in commercial pop music. Many said no, stubborn in their indie principles that true music runs an inverse correlation to it’s popularity; that is to say if no one likes you you’re doing something right. To write something popular was a sin. Selling out to the mighty Dollar/Yen/Belgian Franc (some of these discussions took place pre-Euro) was to be cast in to the pit of eternal damnation, destined to be well liked and with some money to buy frivolous things like clothes and food. I, on the other hand, held no such stoical, myopic principles. You see, for me, popularity is not the anti-thesis of artistic integrity. The two are not mutually exclusive. Artistic integrity is derived from the purpose of the artists creation. That is to say if a musical piece, poem, film, installation etc comes from some place real within that individual or group and has been created without regard for it’s popularity, then any subsequent resonance that strikes with whatever number of people is irrelevant. Integrity comes from the intention of the piece, not how it is received. This is something that Frank as a film explores in more depth than any non-documentary film I can remember. Both arguments are represented with Jon as the commercially driven narcissist, Clara his polar opposite, albeit equally as narcissistic in her own way, with Frank the conflicted artist who just wants people to love his music. Frank benefits from a number of contributing factors that put it squarely in Hooray For Movies’s Top 5 films of 2014 so far; talented British director with a penchant for exploring delicate group dynamics; strong source material in Jon Ronson’s novel of the same name; a wonderful supporting cast of actors and musicians who bring genuine artistic spirit to it’s themes of integrity, isolation, mental health and loyalty. 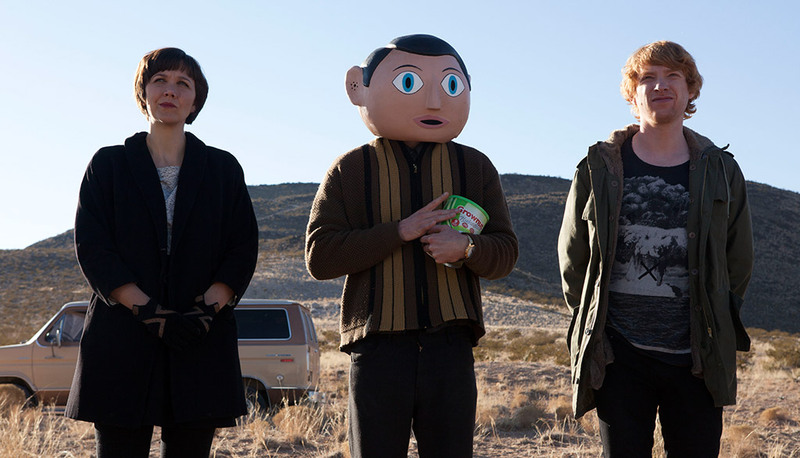 It is a standout performance from Michael Fassbender as the eponymous eccentric leader of the band who does something extraordinary from behind the confines of a giant papier mache head. Despite playing a character who can, for obvious reasons, only display one slightly shocked facial expression throughout the movie, Fassbender somehow projects every emotional range through his soft American accent, wild body language and pitch perfect delivery of Ronson’s words, to the point that you will swear at the end that his face must have moved. It must have. Because there is no way that one man should be able to do so much damage to my laugh muscles and tear ducts without being able to see his eyes. Conclusion: Funny. Moving. Touching. Important. See it. Now.